Ray Bourque was my favorite player growing up. My grandmother won a raffle put on by my youth hockey program and her prize was a Ray Bourque stick signed by the 1992-93 Bruins and she gave it to me. Well, she gave to my older brother and I, but I took it and had my dad hang it up on my wall in my bedroom. Every image or video or hockey card of Bourque’s I would check to see if he was still using the same Sher-Wood Feather-Glas P.M.P. 7030 stick, and he always did right until his retirement. In the summer of 1997, my family was in Boston because my sister had a dance competition, and rather than watch competitive tap, ballet and jazz dancing for three straight days at the back of the ballroom/auditorium/theater and serve as a sarcastic judge with my dad and brother, the three of us and took the T to North Station for a tour of the new FleetCenter. Joe Thornton had just been drafted first overall by the Bruins and Joe Thornton apparel with his No. 6 jersey (thankfully, he switched to 19) was everywhere, so it only made sense that as a 10-year-old hockey-crazed kid, I would be intrigued by the league’s next supposed superstar. Bourque, the Bruins’ captain, was traded during the 1999-00 season to the Avalanche to chase the Cup he had never won, and he did so in 2000-01, retiring after the Game 7 win over the Devils. Thornton, the Bruins’ captain, was dealt to the Sharks shortly after the 2004-05 lockout in one of the worst trades in professional sports history as he became the only league MVP to be traded in the middle of their MVP season. Aside from those two players, I never really liked any other Bruin. Sure, Bobby Orr is arguably the greatest hockey player of all time, and everybody loves him, but he stopped playing 10 years before I was born. And yeah, I guess Cam Neely was cool and Andy Moog was likable (especially if you had Don Cherry’s Rock’em Sock’em Hockey Volume 2) and Gerry Cheevers had the awesome stitches mask and Jason Allison might be the most underrated player ever and Patrice Bergeron has been a great story since breaking camp with the team as an 18-year-old rookie in 2003. But for the few easy-to-root-for guys, there has been way more hard-to-root-for guys over the years and two of the hardest ones are still on the team in Zdeno Chara and Brad Marchand. The problem is now two of my Top 10 personal favorites of all time are on the Bruins in Rick Nash and Brian Gionta, and the texts have been pouring in asking me if I’m rooting for the Bruins to win the Cup this spring. I’m stuck deciding if my personal liking of Nash and Gionta outweighs my personal dislike of Chara and Marchand and Boston sports and all of my friends from college who are Bruins fans, who I don’t want to see win the Cup for the second time in eight years and reach the Final for the third time in as many years. 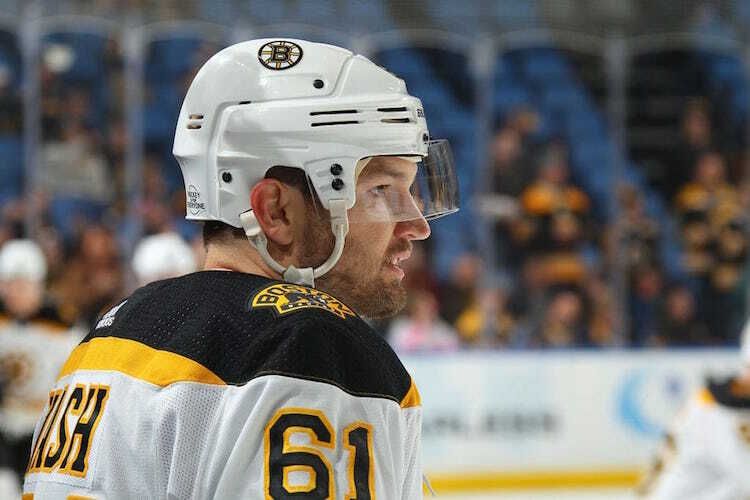 Why did it have to be the Bruins for Rick Nash? I’m sure playing for a contender and being in close proximity to his wife and kids in New York was a strong reason for putting them on the top of his OK’d trade list. And I’m sure that played a much larger role in his putting together that list than my personal feelings or any Rangers fans’ feelings. But now I have to watch Nash wear that 61 in Black and Gold and do his best to help a Boston team win a championship, all while having those college friends tell me how good he is and ask why he was declining with the Rangers. And why did it have to be the Bruins for Brian Gionta? My favorite college hockey player of all time already helped the Devils to a Stanley Cup in his second professional season, put together a 52-goal season for the Rangers’ cross-river rival and then went on to captain the Canadiens. I guess it only makes sense that the Rochester native would complete the trifecta and go to the Bruins following a personal resurgence on a bad Team USA squad at the Olympics. Maybe Gionta can go to the Islanders, Flyers, Penguins or Capitals next season for a career grand finale. In an ideal world, the Bruins will get knocked out of the playoffs in the first round to increase the value of the first-round pick the Rangers received for Nash and then Nash re-signs with the Rangers on July 1, which seems like a given anyway. That would mean no Cup for Nash, but it would mean no Cup for Boston, no highlights of Nash helping Boston win a championship and a better chance at a faster rebuild for the Rangers. As for Gionta? Well, he already has a Cup to his name even if it was 15 years ago when he won it. I can’t root for Nash to win the Cup in Boston. I just can’t have that, the way I can’t have Ryan Callahan, Anton Stralman, Dan Girardi, Ryan McDonagh and J.T. Miller winning it in Tampa Bay. Aside from the simple fact that I can’t stomach another post-2004 Boston championship, Nash is most likely coming back to the Rangers (at least that is what I have convinced myself of) and I need him hungrier than ever to win it all. I can’t have him cashing in once last time and riding off into the sunset with a ring on his finger and Henrik Lundqvist becoming the Rangers’ Don Mattingly. So no, I’m not a Bruins fan. I’m a Rick Nash and Brian Gionta fan. I understand that rooting for Nash and Gionta to do well essentially means rooting for the Bruins to do well, but I will refuse to think of it like that. Instead, I will root for them, but against Tuukka Rask.